British designer and typographer Paul Barnes talked about how letter carvings on tombstones in his country’s graveyards inspired his typeface designs at a lecture organised last month by The Design Society. 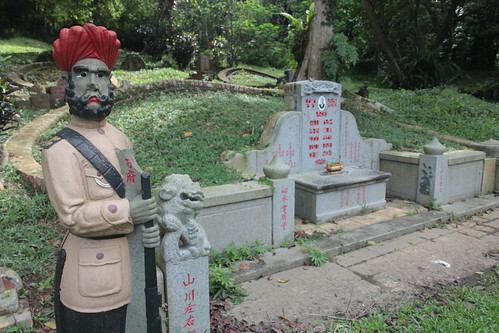 Well, maybe Singapore’s designers can take some inspiration from the over 80,000 tombs found in one of the last remaining graveyards in this city-state — Bukit Brown Cemetery. 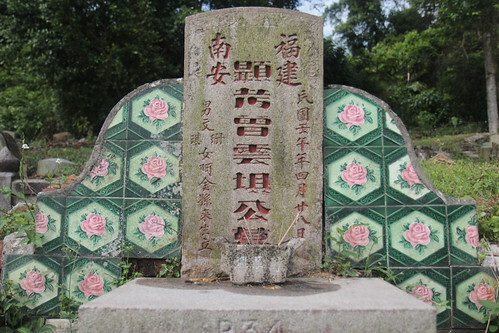 While doing research for a story about this cemetery that first opened in 1922, I discovered many highly decorated tombstones of the rich and famous of Singapore’s history. Most of these were tombs of the Chinese, so the designs reflected the rich symbolism of their culture. The stone lion for instance, is a very common statue that the Chinese believe will help to ward off evil spirits. You will find them outside temples and homes, and also next to tombstones. 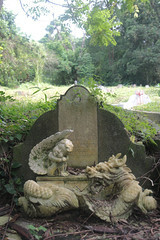 At the cemetery, there even a variety of designs of these lions. Besides lions, there are also other statues to accompany the dead, including chamber maids, and this Sikh Guard below, who is also thought to be able to act as guards for the tombs. 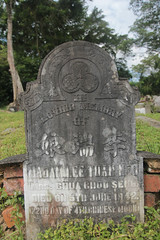 After all, the Chinese believe in afterlife and tombs are regarded as the homes of the dead. Another distinct local flavour to some of the tombs are the colourful Art Noveau tiles that were popular with Peranakans and wealthy Chinese of the past. They also decorated their homes with such tiles. Another form of design that reflected a mix in cultures were in these tombs that had both Eastern and Western symbols. These are just a small sample of the many intricately designed tombstones in the cemetery, and you can see more pictures I took here. Make a trip down as the cemetery, before it is eventually exhumed for future redevelopment. It’s pretty easy to walk around and explore the cemetery, but you can also use this map created by the Asian Paranormal Investigators, especially if you want to find out which of the tombs belonged to the many pioneers of Singapore’s history.